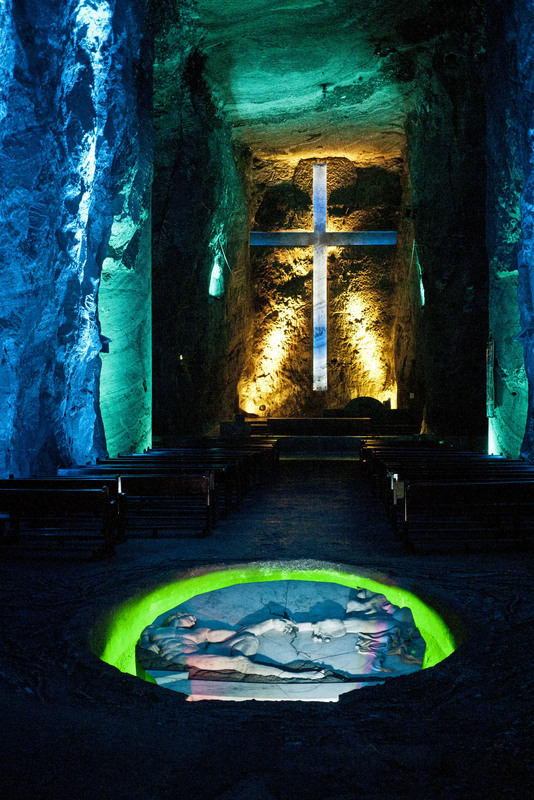 Situated about 50km North of Bogota is Zipaquira, a town that is founded on salt mining. The surrounding area was once a massive inland sea which evaporated leaving a layer of salt. Through time and geologic folding this has created a big deposit of salt above the town. This has been mined since well before the Spanish arrived but they brought modern mining techniques. 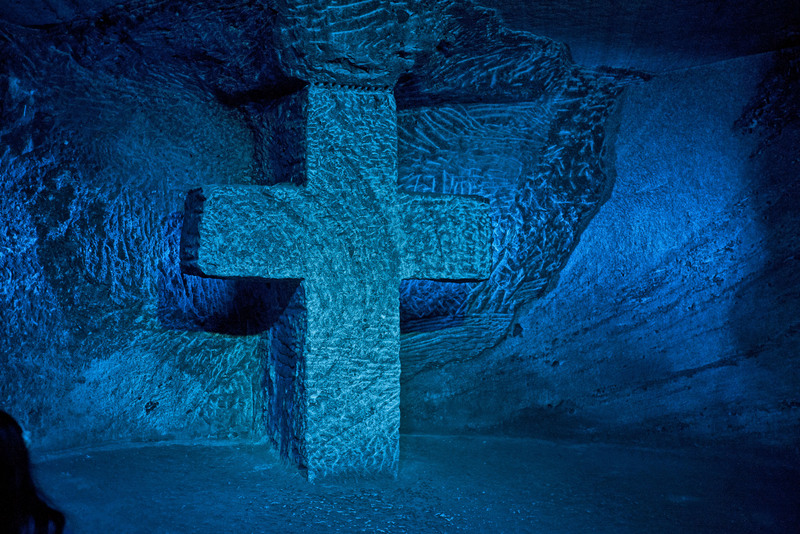 The tunnels created by the mining have been used to create a massive Salt Cathedral under the ground. The Cathedral is absolutely enormous consisting of huge corridors cut through the rock (a mixture of salt and carbon). The main Nave of the cathedral can accommodate 8400 people for the services but the main use now is as a tourist attraction – in fact they claim to be the most popular attraction in Colombia. You have to enter the Cathedral with a tour but these are big groups of people (about 100) and the tour was in Spanish so we decided to lag back and explore the cathedral on our own. 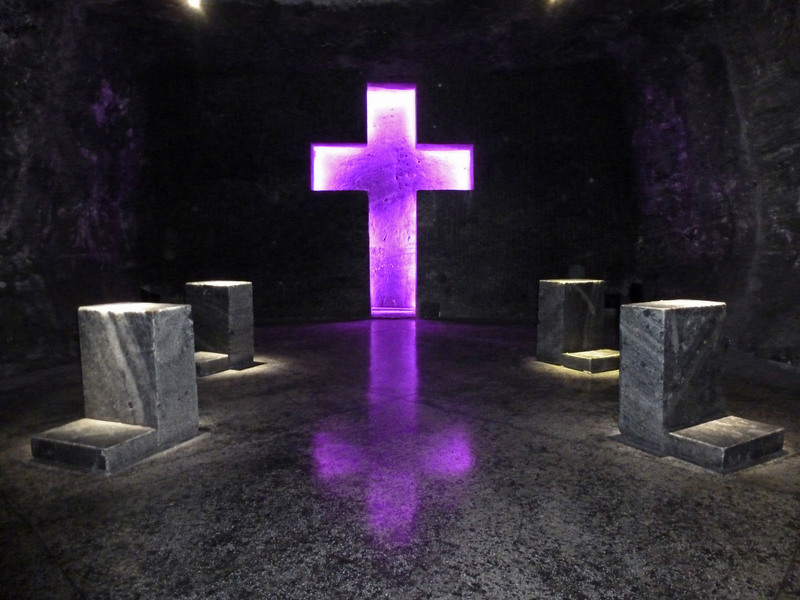 The first section of the cathedral is a tunnel with 13 crosses each representing one step of the day that Jesus was crucified. 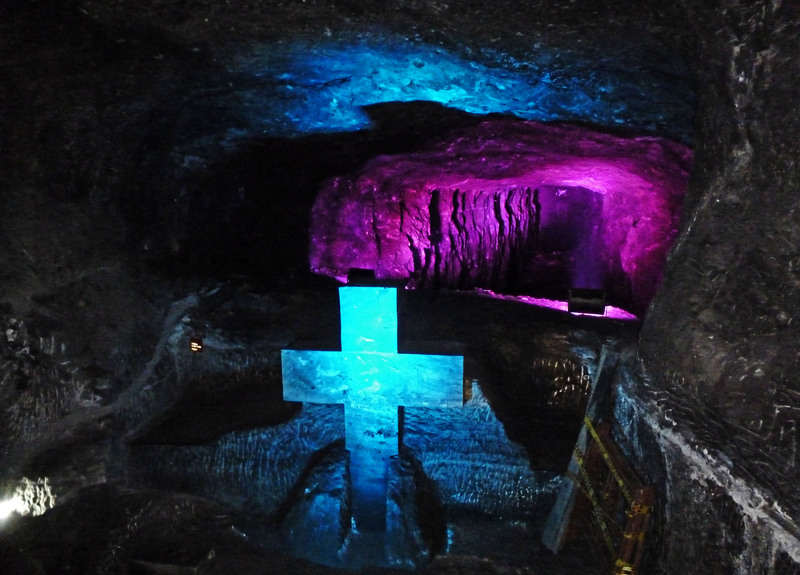 The crosses are carved out of the rock and each is different and lit in a different way. Some are backed by vast tunnels that stretch 200 metres into the rock. After passing the crosses you move down into the three massive chambers of the cathedral itself. The central one of these had a huge cross at one end and pews arranged before an altar. 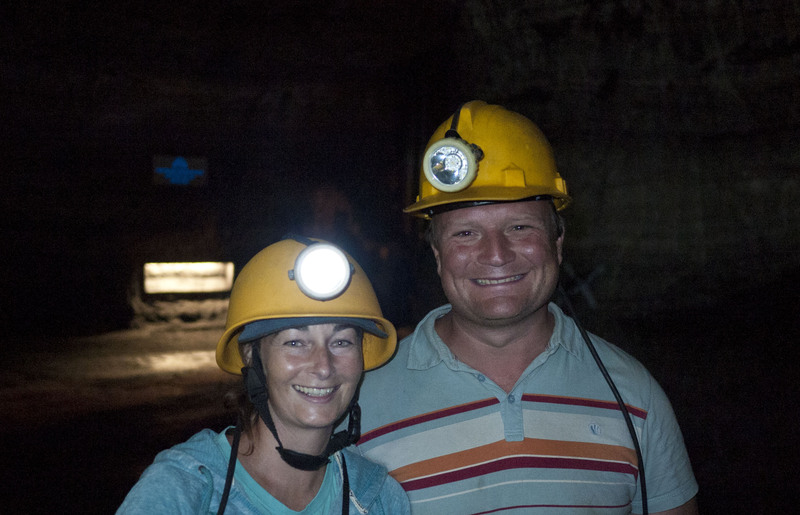 We had also arranged to do a Miner’s route tour in the cathedral. To do this we were outfitted with hard hats and miner’s lights and lead into a labyrinth of tunnels above the cathedral. 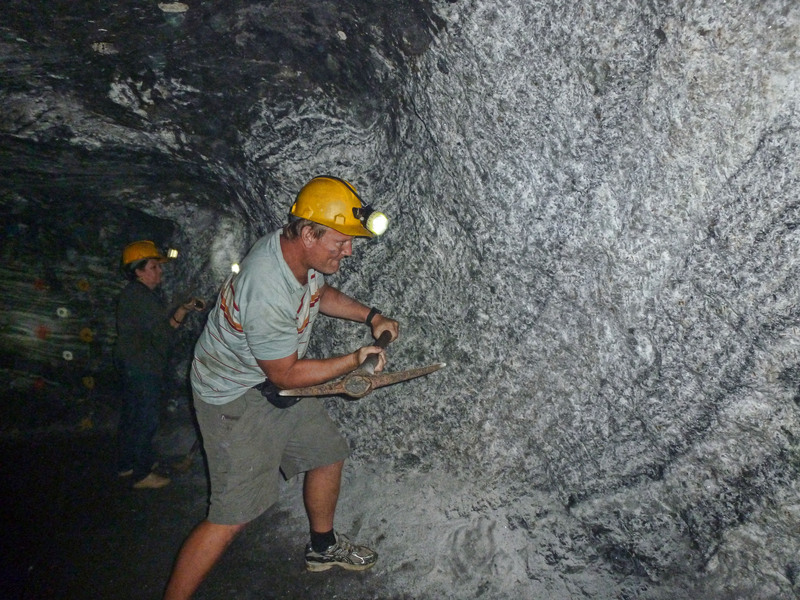 The guide explained some of the geology and how the mining was carried out .The highlight of this tour was using a pick-axe to mine some salt. The rock is surprisingly hard and it takes a number of consecutive strikes of the pick in the same place to chip off a chunk of salt. In the days before explosives this would have been very hard work.